The International Style is a major architectural style that was developed in the 1920s and 1930s and was closely related to modernism and modern architecture. It was first defined by Museum of Modern Art curators Henry-Russell Hitchcock and Philip Johnson in 1932, based on works of architecture from the 1920s. It is defined by the Getty Research Institute as "the style of architecture that emerged in Holland, France, and Germany after World War I and spread throughout the world, becoming the dominant architectural style until the 1970s. The style is characterized by an emphasis on volume over mass, the use of lightweight, mass-produced, industrial materials, rejection of all ornament and color, repetitive modular forms, and the use of flat surfaces, typically alternating with areas of glass." Around 1900 a number of architects around the world began developing new architectural solutions to integrate traditional precedents with new social demands and technological possibilities. The work of Victor Horta and Henry van de Velde in Brussels, Antoni Gaudí in Barcelona, Otto Wagner in Vienna and Charles Rennie Mackintosh in Glasgow, among many others, can be seen as a common struggle between old and new. These architects were not considered part of the International Style because they practiced in an "individualistic manner" and seen as the last representatives of Romanticism. The International Style can be traced to buildings designed by a small group of modernists, of which the major figures includes Ludwig Mies van der Rohe, Jacobus Oud, Le Corbusier, Richard Neutra and Philip Johnson. The founder of the Bauhaus school, Walter Gropius, along with prominent Bauhaus instructor, Ludwig Mies van der Rohe, became known for steel frame structures employing glass curtain walls. One of the world's earliest modern buildings where this can be seen is a shoe factory designed by Gropius in 1911 in Alfeld-an-der-Leine, Germay, called the Fagus Works building. The first building built entirely on Bauhaus design principles was the concrete and steel Haus am Horn, built in 1923 in Weimar, Germany, designed by Georg Muche. The Gropius designed Bauhaus school building in Dessau, built 1925–26 and the Harvard Graduate Center (Cambridge, Massachusetts; 1949–50) also known as the Gropius Complex, exhibit clean lines and a "concern for uncluttered interior spaces". Marcel Breuer, a recognized leader in Béton Brut (Brutalist) architecture and notable alumni of the Bauhaus, who also pioneered the use of plywood and tubular steel in furniture design, and who after leaving the Bauhaus would later teach alongside Gropius at Harvard, is as well an important contributor to Modernism and the International Style. Prior to use of the term 'International Style', some American architects—such as Louis Sullivan, Frank Lloyd Wright, and Irving Gill—exemplified qualities of simplification, honesty and clarity. Frank Lloyd Wright's Wasmuth Portfolio had been exhibited in Europe and influenced the work of European modernists, and his travels there probably influenced his own work, although he refused to be categorized with them. His buildings of the 1920s and 1930s clearly showed a change in the style of the architect, but in a different direction than the International Style. In Europe the modern movement in architecture had been called Functionalism or Neue Sachlichkeit (New Objectivity), L'Esprit Nouveau, or simply Modernism and was very much concerned with the coming together of a new architectural form and social reform, creating a more open and transparent society. The "International Style", as defined by Hitchcock and Johnson, had developed in 1920s Western Europe, shaped by the activities of the Dutch De Stijl movement, Le Corbusier, and the Deutscher Werkbund and the Bauhaus. Le Corbusier had embraced Taylorist and Fordist strategies adopted from American industrial models in order to reorganize society. He contributed to a new journal called L'Esprit Nouveau that advocated the use of modern industrial techniques and strategies to create a higher standard of living on all socio-economic levels. In 1927, one of the first and most defining manifestations of the International Style was the Weissenhof Estate in Stuttgart, overseen by Ludwig Mies van der Rohe. It was enormously popular, with thousands of daily visitors. 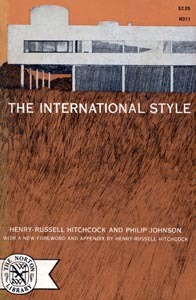 Philip Johnson co-defined the International Style with Henry-Russell Hitchcock as a young college graduate, and later became one of its practitioners. The exhibition Modern Architecture: International Exhibition ran from February 9–March 23, 1932, at the Museum of Modern Art (MoMA), in the Heckscher Building at Fifth Avenue and 56th Street in New York. Beyond a foyer and office, the exhibition was divided into six rooms: the "Modern Architects" section began in the entrance room, featuring a model of William Lescaze's Chrystie-Forsyth Street Housing Development in New York. From there visitors moved to the centrally placed Room A, featuring a model of a mid-rise housing development for Evanston, Illinois, by Chicago architect brothers Monroe Bengt Bowman and Irving Bowman, as well as a model and photos of Walter Gropius's Bauhaus building in Dessau. In the largest exhibition space, Room C, were works by Le Corbusier, Ludwig Mies van der Rohe, J.J.P. Oud and Frank Lloyd Wright (including a project for a house on the Mesa in Denver, 1932). Room B was a section titled "Housing", presenting "the need for a new domestic environment" as it had been identified by historian and critic Lewis Mumford. In Room D were works by Raymond Hood (including "Apartment Tower in the Country" and the McGraw-Hill building) and Richard Neutra. In Room E was a section titled "The extent of modern architecture", added at the last minute, which included the works of thirty seven modern architects from fifteen countries who were said to be influenced by the works of Europeans of the 1920s. Among these works was shown Alvar Aalto's Turun Sanomat newspaper offices building in Turku, Finland. After a six-week run in New York City, the exhibition then toured the USA – the first such "traveling-exhibition" of architecture in the US – for six years. MoMA director Alfred H. Barr hired architectural historian and critic Henry-Russell Hitchcock and Philip Johnson to curate the museum's first architectural exhibition. The three of them toured Europe together in 1929. The three of them also discussed Hitchcock's book about modern art. By December 1930, the first written proposal for an exhibition of the "new architecture" was set down, yet the first draft of the book was not complete until some months later. The exhibition catalog, "Modern Architecture: International Exhibition"
The book, The International Style: Architecture Since 1922, published by W.W. Norton & Co. in 1932. Previous to the 1932 exhibition and book, Hitchcock had concerned himself with the themes of modern architecture in his 1929 book Modern Architecture: Romanticism and Reintegration. According to Terence Riley: "Ironically the (exhibition) catalogue, and to some extent, the book The International Style, published at the same time of the exhibition, have supplanted the actual historical event." Hitchcock and Johnson's exhibition catalog identified three principles of the style: volume of space (as opposed to mass and solidity), regularity, and flexibility. Hitchcock and Johnson identified three principles: the expression of volume rather than mass, the emphasis on balance rather than preconceived symmetry, and the expulsion of applied ornament. Common characteristics of the International Style include: a radical simplification of form, a rejection of ornament, and adoption of glass, steel and concrete as preferred materials. Further, the transparency of buildings, construction (called the honest expression of structure), and acceptance of industrialized mass-production techniques contributed to the international style's design philosophy. Finally, the machine aesthetic, and logical design decisions leading to support building function were used by the International architect to create buildings reaching beyond historicism. The ideals of the style are commonly summed up in three slogans: ornament is a crime, truth to materials, form follows function; and Le Corbusier's description: "A house is a machine to live in". The exhibition excluded other contemporary styles that were exploring the boundaries of architecture at the time, including: Art Deco, German Expressionism, for instance the works of Hermann Finsterlin, and the Organicist movement, popularized in the work of Antoni Gaudí. As a result of the 1932 exhibition, the principles of the International Style were endorsed, while other styles were seen as less significant. In 1922, the competition for the Tribune Tower and its famous second-place entry by Eliel Saarinen gave some indication of what was to come, though these works would not have been accepted by Hitchcock and Johnson as representing the "International Style". Similarly, Johnson, writing about Joseph Urban's recently completed New School for Social Research in New York, stated: "In the New School we have an anomaly of a building supposed to be in a style of architecture based on the development of the plan from function and facade from plan but which is a formally and pretentiously conceived as a Renaissance palace. Urban's admiration for the New Style is more complete than his understanding." California architect Rudolph Schindler's work was not a part of the exhibit, though Schindler had pleaded with Hitchcock and Johnson to be included. Then, "[f]or more than 20 years, Schindler had intermittently launched a series of spirited, cantankerous exchanges with the museum." The Glass Palace, Heerlen, Netherlands, Frits Peutz (1935). The gradual rise of the Nazi regime in Weimar Germany in the 1930s, and the Nazis' rejection of modern architecture, meant that an entire generation of avant-gardist architects, many of them Jews, were forced out of continental Europe. Some, such as Mendelsohn, found shelter in England, while a considerable number of the Jewish architects made their way to Palestine, and others to the USA. However, American anti-Communist politics after the war and Philip Johnson's influential rejection of functionalism have tended to mask the fact that many of the important architects, including contributors to the original Weissenhof project, fled to the Soviet Union. This group also tended to be far more concerned with functionalism and its social agenda. Bruno Taut, Mart Stam, the second Bauhaus director Hannes Meyer, Ernst May and other important figures of the International Style went to the Soviet Union in 1930 to undertake huge, ambitious, idealistic urban planning projects, building entire cities from scratch. In 1936, when Stalin ordered them out of the country, many of these architects became stateless and sought refuge elsewhere; for example, Ernst May moved to Kenya. The White City of Tel Aviv refers to a collection of over 4,000 buildings built in the International Style in the 1930s. Many Jewish architects who had studied at the German Bauhaus school designed significant buildings here. A large proportion of the buildings built in the International Style can be found in the area planned by Patrick Geddes, north of Tel Aviv's main historical commercial center. In 1994, UNESCO proclaimed the White City a World Heritage Site, describing the city as "a synthesis of outstanding significance of the various trends of the Modern Movement in architecture and town planning in the early part of the 20th century". In 1996, Tel Aviv's White City was listed as a World Monuments Fund endangered site. Villa in Södra Ängby in western Stockholm, Sweden, Edvin Engström (1938). The residential area of Södra Ängby in western Stockholm, Sweden, blended an international or functionalist style with garden city ideals. Encompassing more than 500 buildings, most of them designed by Edvin Engström, it remains the largest coherent functionalist or "International Style" villa area in Sweden and possibly the world, still well-preserved more than a half-century after its construction in 1933–40 and protected as a national cultural heritage. With the rise of Nazism, a number of key European modern architects fled to the USA. When Walter Gropius and Marcel Breuer fled Germany they both arrived at the Harvard Graduate School of Design, in an excellent position to extend their influence and promote the Bauhaus as the primary source of architectural modernism. When Mies fled in 1938, he first fled to England, but on emigrating to the USA he went to Chicago, founded the Second School of Chicago at IIT and solidified his reputation as a prototypical modern architect. After World War II, the International Style matured; Hellmuth, Obata & Kassabaum (later renamed HOK) and Skidmore, Owings & Merrill (SOM) perfected the corporate practice, and it became the dominant approach for decades in the US and Canada. Beginning with the initial technical and formal inventions of 860-880 Lake Shore Drive Apartments in Chicago its most famous examples include the United Nations headquarters, the Lever House, the Seagram Building in New York City, and the campus of the United States Air Force Academy in Colorado Springs, Colorado, as well as the Toronto-Dominion Centre in Toronto. Further examples can be found in mid-century institutional buildings throughout North America and the "corporate architecture" spread from there, especially to Europe. In Canada, this period coincided with a major building boom and few restrictions on massive building projects. International Style skyscrapers came to dominate many of Canada's major cities, especially Ottawa, Montreal, Vancouver, Calgary, Edmonton, Hamilton, and Toronto. While these glass boxes were at first unique and interesting, the idea was soon repeated to the point of ubiquity. A typical example is the development of so-called Place de Ville, a conglomeration of three glass skyscrapers in downtown Ottawa, where the plans of the property developer Robert Campeau in the mid 1960s and early 1970s—in the words of historian Robert W. Collier, "forceful and abrasive, he was not well-loved at City Hall"—had no regard for existing city plans, "built with contempt for the existing city and for city responsibilities in the key areas of transportation and land use". Architects attempted to put new twists into such towers, such as the Toronto City Hall by Finnish architect Viljo Revell. By the late 1970s a backlash was under way against modernism—prominent anti-modernists such as Jane Jacobs and George Baird were partly based in Toronto. In June 2007 UNESCO proclaimed Ciudad Universitaria of the Universidad Nacional Autónoma de México (UNAM), in Mexico City, a World Heritage Site due to its relevance and contribution in terms of international style movement. It was designed in the late 1940s and built in the mid-1950s based upon a masterplan created by architect Enrique del Moral. His original idea was enriched by other students, teachers, and diverse professionals of several disciplines. The university houses murals by Diego Rivera, Juan O'Gorman and others. The university also features Olympic Stadium (1968). In his first years of practice, Pritzker Prize winner and Mexican architect Luis Barragán designed buildings in the International Style. But later he evolved to a more traditional local architecture. Other notable Mexican architects of the International Style or modern period are Carlos Obregón Santacilia, Augusto H. Alvarez, Mario Pani, Federico Mariscal, Vladimir Kaspé, Enrique del Moral, Juan Sordo Madaleno, Max Cetto, among many others. In Brazil Oscar Niemeyer proposed a more organic and sensual International Style. He designed the political landmarks (headquarters of the three state powers) of the new, planned capital Brasilia. The masterplan for the city was proposed by Lucio Costa. In 1930, Frank Lloyd Wright wrote: "Human houses should not be like boxes, blazing in the sun, nor should we outrage the Machine by trying to make dwelling-places too complementary to Machinery." In Elizabeth Gordon's well-known 1953 essay, "The Threat to the Next America," she criticized the style and associated it with totalitarianism and communism. In 1966, architect Robert Venturi published Complexity and Contradiction in Architecture, essentially a book-length critique of the International Style. Architectural historian Vincent Scully regarded Venturi's book as 'probably the most important writing on the making of architecture since Le Corbusier's Vers une Architecture. It helped to define postmodernism. Best-selling American author Tom Wolfe wrote a book-length critique, From Bauhaus to Our House, portraying the style as elitist. In 2006, Hugh Pearman, the British architectural critic of The Times, observed that those using the style today are simply "another species of revivalist", noting the irony. The negative reaction to internationalist modernism has been linked to public antipathy to overall development. In the preface to the 2007 fourth edition of his book Modern Architecture: A Critical History, Kenneth Frampton argued that there had been a "disturbing Eurocentric bias" in histories of modern architecture. This "Eurocentrism" included the USA. ^ "International Style (modern European architecture style)". Art & Architecture Thesaurus. Getty Research Institute. ^ a b "International Style | architecture". Encyclopedia Britannica. Retrieved 2018-09-17. ^ "Bauhaus and its Sites in Weimar, Dessau and Bernau". UNESCO. Retrieved 8 December 2018. ^ "How to visit the building at the heart of Germany's Bauhaus movement". The Independent. Retrieved 2018-09-19. ^ "Marcel Breuer's Iconic Atlanta Library: Archived October 2010". centralbranchlibrary.blogspot.com. Retrieved 2018-09-19. ^ "About: Marcel Breuer". Marcel Breuer's Central Public Library - Atlanta. 2008-12-22. Retrieved 2018-09-19. ^ "A Movement in a Moment: The International Style | Architecture | Agenda | Phaidon". Phaidon. Retrieved 2018-09-19. ^ a b Wright, Frank Lloyd (2005). Frank Lloyd Wright: An Autobiography. Petaluma, CA: Pomegranate Communications. pp. 60–63. ISBN 0-7649-3243-8. ^ "The Architectural Work of Le Corbusier". UNESCO World Heritage Centre. United Nations Educational, Scientific and Cultural Organization. Retrieved 19 July 2016. ^ "Siedlungshäuser: Die Häuser der Weissenhofsiedlung". Weissenhofsiedlung. Retrieved 10 August 2011. ^ "Modern Architecture: International Exhibition". Museum of Modern Art. ^ Baharak Tabibi, Exhibitions as the Medium of Architectural Reproduction - "Modern Architecture: International Exhibition", Department of Architecture, Middle East Technical University, 2005. ^ a b Hitchcock, Henry-Russell; Johnson, Philip (1932). Modern Architecture: International Exhibition (PDF). Museum of Modern Art. ^ Terence Riley, The International Style: Exhibition 15 and The Museum of Modern Art. New York, Rizzoli, 1992. ^ Evenson, Norma (1969). Le Corbusier: The Machine and the Grand Design. New York: George Braziller. p. 7. ^ Hines, Thomas (1982). Richard Neutra and the Search for Modern Architecture. Oxford University Press. p. 105. ISBN 0-19-503028-1. ^ Morgan, Susan (2015). "Not Another International Style Ballyhoo: A Short History of the Schindler House". MAK Center for Art and Architecture. ^ Claudia Quiring, Wolfgang Voigt, Peter Cachola Schmal, Eckhard Herrel (eds), Ernst May 1886–1970, Munich, Prestel, 2011. ^ The New York Times. "A City Reinvents Itself Beyond Conflict". Accessed 25 February 2010. ^ Robert W. Collier, Contemporary Cathedrals – Large scale developments in Canadian cities, Harvest House, Montreal, 1975. ^ Botey, Josep (1996). Oscar Niemeyer. Barcelona: Gustavo Gili. ISBN 8425215765. ^ Venturi, Robert (1966). Complexity and Contradiction in Architecture (PDF). Museum of Modern Art. ^ Stierli, Martino (December 22, 2016). "Complexity and Contradiction changed how we look at, think and talk about architecture". Architectural Review. ^ Gabion: Modernism – or should that be Modernwasm? ^ Kenneth Frampton, Modern Architecture: A Critical History, London, Thames and Hudson, 2007. Wikimedia Commons has media related to International style.